Dutch railway station development/service department has an excellent office space located in Utrecht. 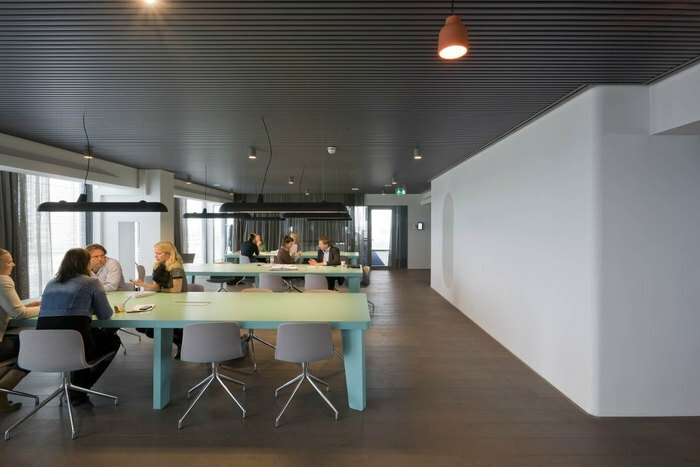 Designed by NL Architects, the new space introduces an open plan office, but uses innovative Thick Walls to help break it up into smaller, more manageable portions. “The Katreinetoren in Utrecht is the home base of NS Stations, the department of the Dutch Railway (NS) that develops and services railway stations in the Netherlands. The 15 stories 55m high tower is built right on top of Utrecht Centraal, the biggest railway station in the Netherlands. The entrance is positioned conveniently in the Central Hall! The width of the building is based on the dimensions of the railway tracks below. The interior is dominated by this concrete structure: the elevator core and structural beams remain in sight. A reconstruction took place in 1999 when the Brutalist mid-seventies building was wrapped in a glass skin.The current floor plan consists of typical cellular offices along the facade and an oversized hallway in the center. The basic idea is to introduce a series of perpendicular walls that will organize the space. By ‘inflating’ these partitioning walls they can become storage spaces. The shelves can absorb most of the clutter that normally spreads trough the office, such as wardrobes, bookshelves, flip boards, archive, bulletin boards. And sometimes even the stairs. The Thick Walls™ will clean up the space. The Thick Walls™ can take different shapes to introduce specific functionalities and atmospheres. The open plan with the Thick Walls™ divides the space in several clusters of different sizes. As opposed to a regular layout with cells linked to a corridor, a continuous, flowing space is created. Traffic space is eliminated: gross becomes net! The main asset of this system is increased connectivity; instead of a workforce relatively isolated in cells, here interaction will come natural. The perpendicular Wall Unit explores the spatial potential of the building; an extensive ‘field’ condition is created while keeping a sense of compactness and intimacy. A working station consists of an ergonomic office chair and a table that is individually adjustable in height. With this unit an endless number of configurations is possible.